Sussex captain Ed Joyce says it felt good to end a 32-year "hoodoo" against Warwickshire on Wednesday. The seven-wicket victory was Sussex's first victory at Edgbaston since 1982. 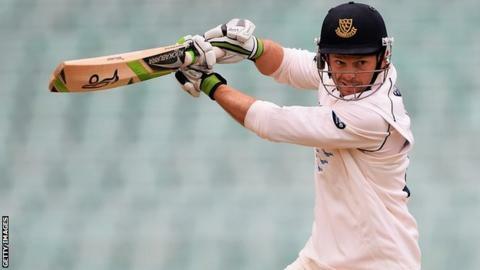 "We as a team had huge motivation to come here and win after a long time not winning," the 35-year-old batsman told BBC Sussex. Sussex's victory at Warwickshire this week was their first County Championship win away to the Bears since 1982. The Hove outfit had lost 10 games and drawn 12 four-day games in the intervening years. "I realised I had never beaten Warwickshire in a four-day game of cricket so it is a hoodoo off Sussex's back and a hoodoo off mine as well." The Irishman added: "I have to admit I was a little bit nervous on the final morning as 330 is a lot of runs and you don't expect to win too many games chasing that in the last dig. "We only needed 50-odd runs to win with eight wickets and you are just hoping you don't make a boo-boo and lose the game but we were pretty comfortable. "It was a slow pitch and, with a new ball around the corner, you just never know. If you take your foot off the gas you are asking for trouble." Sussex cricket manager Mark Robinson was not in the Midlands to see the victory, with the 47-year-old believed to be attending an interview with the England & Wales Cricket Board over a possible position with the national team. "He texted me and said it was a good achievement - understated as always," Joyce said. "I just said 'good luck' to him. "Hopefully things go well for him wherever he is. "He's in a very exciting place as well. Not only have we won here, he is being talked about in glowing terms in important circles." Sussex have won both of their opening County Championship matches in 2014 and sit top of the fledgling Division One table. "It's been a great start to the season," Joyce said. "I think our bowling unit has maybe surprised a few. It has been nice to have four seamers running in and Jon Lewis has been brilliant coming into a new team and a new environment."